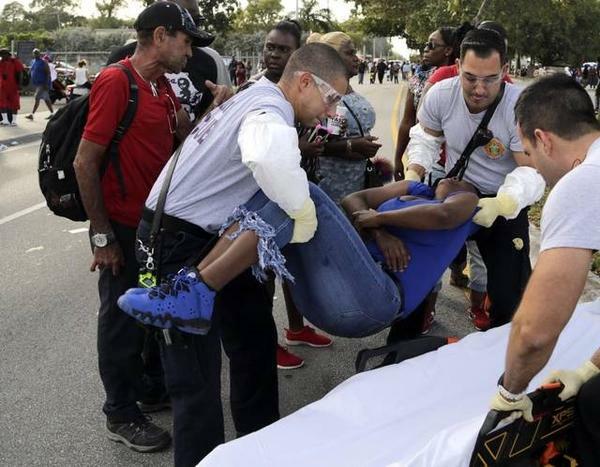 Miami-Dade paramedics aid a woman who fainted after gunshots injured eight people at Martin Luther King Jr. Memorial Park in northwest Miami-Dade Monday afternoon. Martin Luther King Jr. Day in Miami-Dade ended on a note of violence Monday afternoon after a shooting left at least eight people injured at a park that bears the late civil rights leader's name. Police say two people were grazed by the gunfire at Martin Luther King Jr. Memorial Park, in northwest Miami-Dade at 32nd Avenue and 62nd Street, at 3:40 pm. But six others, ranging in age from 14 to 20, received gunshot wounds. One, a 20-year-old man, was taken to Ryder Trauma Center in critical condition. "It's such a sad situation, a sad thing to happen on MLK Day, a day of peace, for a person who represented peace for our nation," said Miami-Dade Police Detective Marjorie Eloi. "People come out to celebrate this day and fall victim to senseless gun violence." Police said early Monday evening that two suspects were in custody and two firearms, both handguns, had been secured. They said they had to determine the cause or motive for the shooting, which occurred shortly after the annual Martin Luther King Jr. Day Parade, as the post-parade celebration began in the park. Copyright 2017 WLRN-FM. To see more, visit WLRN-FM.